Dyadic treatment involves both people, caregiver and child from infancy up to about age 3 or 4, in the room together with me. 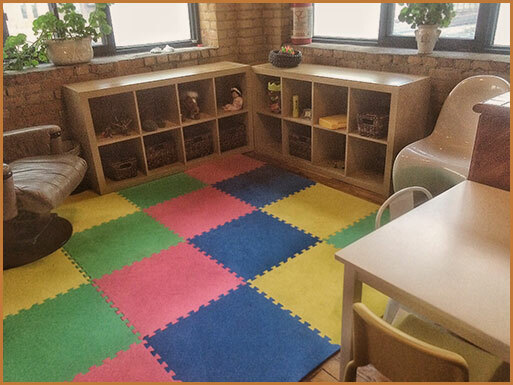 The room is set up specially, to be childproofed safe and to interest and engage the youngster. It is especially useful with parents or other caregivers who are experiencing any kind of problem parenting or any kind of doubt or feelings of inadequacy about their parenting. It also is helpful to assist in cases of adoption or fostering as well as biological parenting. Watch Wait and Wonder is a technique developed for work with children from birth, together with a parent. Usually, only 8 – 12 sessions are needed. Having a baby and becoming a parent can elicit all kinds of unfamiliar and not always pleasant feelings. Dealing with a child who has colic, who or won’t eat or sleep, seems not to bond, or behaves badly, is hard and concerning. This kind of treatment approach can be remarkably effective. Together, we watch the child’s free play. The parent/caregiver is asked to follow the lead of the child and respond to what the child initiates rather than taking over or being educational. Together, parent/caregiver and I wait to see what the child is doing, and wonder about what the baby/child is feeling and what that might mean to the child. Sometimes, this leads to what it evokes in you – what you thought the baby was doing or meaning that led you to react in the way that you did; what you thought about yourself as a parent that might have held you back, for example. We examine those thoughts and feelings and how they seem to fit or not with what we think the child is feeling and what you want to do as a parent. You are the authority.